Life: Mystery and Suspense on Television. Life was his sentence. Life is what he got back. 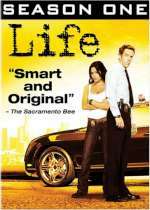 Damian Lewis stars as Charlie Crews, the unconventional police officer-turned-convict-turned-detective with a second chance, in Life, a crime drama series that debuted on NBC in September, 2007. After twelve years in prison for a murder he didn't commit, Crews returns to the force with a $50 million settlement, a new spiritual outlook, a strong fondness for fruit, and a highly unusual approach to solving crime. With the aid of his skeptical and demanding new partner, Dani Reese (Sarah Shahi), he's turning police procedure upside down.